President Donald Trump on Friday signed an executive order to impose new financial sanctions on the Venezuelan government, which his administration considers a "dictatorship." The new sanctions stop short of a full oil embargo but nevertheless constitute a tough measure that will put further pressure on Venezuelan President Nicolas Maduro, the Washington Post reports. The White House issued a statement targeting Maduro's creation of a "constituent assembly" to replace the National Assembly and rewrite the Venezuelan constitution. "The Maduro dictatorship continues to deprive the Venezuelan people of food and medicine, imprison the democratically-elected opposition, and violently suppress freedom of speech," the statement said. "The regime's decision to create an illegitimate Constituent Assembly—and most recently to have that body usurp the powers of the democratically-elected National Assembly—represents a fundamental break in Venezuela's legitimate constitutional order." Venezuela's economy has been collapsing even as Maduro's government has lashed out at the U.S., with Maduro's son even threatening violence against Trump. Unrest has spread as Maduro has tightened his control of all branches of government and cracked down on dissent while the country's economic crisis continues. "We will not stand by as Venezuela crumbles," the White House said. It outlined a prohibition on dealings with new stocks and bonds issued by the Venezuelan government or its state-owned oil company and Citgo parent, Petróleos de Venezuela (PDVSO). "This has been a catastrophe for the country," Treasury Secretary Steve Mnuchin said in Friday's White House press briefing. Mnuchin called Venezuela's situation "unacceptable" and said that the Trump administration is interested in restoring democracy in the country, not regime change per se. The White House statement also accused the Maduro regime of irresponsibly going into debt to prop up its failing finances. "Maduro's economic mismanagement and rampant plundering of his nation's assets have taken Venezuela ever closer to default," the statement said. "His officials are now resorting to opaque financing schemes and liquidating the country's assets at fire sale prices." The White House said the new sanctions will tighten Venezuela's access to the U.S. financial system. 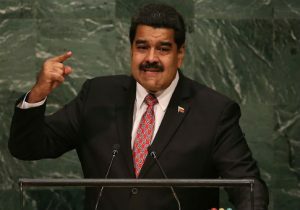 "These measures are carefully calibrated to deny the Maduro dictatorship a critical source of financing to maintain its illegitimate rule, protect the United States financial system from complicity in Venezuela's corruption and in the impoverishment of the Venezuelan people, and allow for humanitarian assistance," the statement said. "The president is making sure that the U.S. financial system will not be complicit in any future further placement of debt that would allow the Venezuelan government to finance this abhorrent behavior," a senior administration official told reporters. The White House said it would allow certain exceptions, such as for humanitarian aid, in order "to mitigate harm to the American and Venezuelan people." At the White House press briefing, national security adviser Gen. H.R. McMaster said that "no military actions are anticipated in the near future" to address the situation in Venezuela. "In terms of military options or other options, there is no such thing anymore as only a military option or a diplomatic option or an economic option," McMaster said. "We try to integrate all elements together." "We always look at a broad range of contingencies and how this might evolve in the future, but obviously any decision would be in conjunction with our partners in the region," he continued. "And no military actions are anticipated in the near future." McMaster downplayed reports that there was a backlash in Latin American countries because of Trump's recent reference to military action. The president told reporters last month that U.S. military action in Venezuela is a possible option. "Venezuela is not very far away, and the people are suffering and they're dying," Trump said. "We have many options for Venezuela, including a possible military option if necessary." McMaster said Friday that Vice President Mike Pence's trip through South America was successful. "I don't think there's ever been a time where we are better aligned with our partners in the region than we are aligned today," McMaster said.